The Dashner Dude: Maze Runner a NY Times Bestseller! SO proud of you James!! Dude, that is SO AWESOME. Major dream come true, and I know how much you wanted this and have worked for it. I bow. A worthy book for the NYTBSL! well, well, well ma man, you've done it. Quite deserved too! Next stop, #1. Keep up the good work. Congrats Dash! Congratulations, James! It is a great book, and deserves to be on that list. Nice work, James. I really hope you take time tonight to relish the moment and the emotions. It's not every day that you have a dream come totally true. Yay James! I sit in awe of you. Hooray! That makes me feel like celebrating!!! I'm so dang happy for you! Way to go! Very awesome. Amazing! Congratulations! Enjoy the high- you deserve it! It hasn't come without work. That's the most excited part. You've worked hard and for YEARS! It must be so rewarding. I hope to be in your shoes in the future. We'll see. Thank you for being such an inspiration. It was only a matter of time Broskie! You're one talented dude. Congratulations, James!!!!!! That is an amazing accomplishment. That deserves some celebration! Congrats! That's so shuckin awesome! It's well deserved Dashner. Wa-hooo!! That is so awesome- congrats! Congratulations on NYTB! To me, all your books have been up there the whole time, it just took the rest of the world longer to realize your awesomeness. Sweeeeet. I was reading your old post and it said that catching fire just got released lol. Now all. 3 books are released woot! I'm soooooo excited for the scorch trials and the death cure. !! Congratulations, James! So glad for you. No one has worked harder. You're a shining light for writers everywhere. Congrats James! We're all so proud of you! Wow - such a watershed moment for you, and us, your readers. You are an inspiration for so many of us. Well done! Congratulations James on this well-deserved accomplishment! I couldn't be more proud of you or happy for you, James! Congrats, James! You've worked hard and are a great example to the newbie/wannabe me. Jamie!!! I am beyond proud of you! Congratulations! You are twenty shades of totally awesome! It's a well deserved honor. Just don't forget all us poor, struggling writers who bask in your glory. J/K. You are one of the most down-to-earth, honestly cool guys. Congrats. You definitely deserved it. See you at the Roundup. So happy for you! I remember Jeff Savage predicting that you'd be a NYT bestseller after The Maze Runner hit the market. So glad to see it happen for you! I saw Maze Runner in Sam's Club just yesterday and thought, I bet that book hits the NY best seller list one day. You made my thoughts prophetic--immediately! That is so awesome and I am so geunuinely happy for you. Incredible news. You're the Man! I knew it was going to happen ;-). We were on vacation a few weeks ago and in the hotel I was reading USA today, an interview with Hunger Games author Suzanne Collins was asked what book she recommends for her readers now that hers are done.... YOURS!! So cool! You are Naomi's Hero! Congratulations for grabbing the brass ring and proving that hard work and endurance are key. Thanks for mentoring others and raising the bar! Enjoy the ride! You deserve it! If you didn't get emotional after putting as much of yourself as you have into your book, you'd be crazy. CONGRATULATIONS! That is so wonderful. If you didn't get emotional, we'd wonder if you were alive. :) Congrats again. I love your books but PLEASE stop writing y'all as ya'll - that is so wrong and I don't know how it made it past the editor - aren't they supposed to catch those things? Ya'll is NEVER right. Thanks for letting me vent. Keep the creative juices flowing!! Major congratulations James! Allow yourself to enjoy it-that's what all that hard work is about. 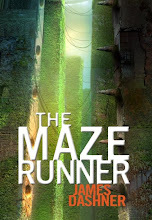 I'm a big fan of Maze Runner and it deserves to be on the list! I was thrilled to see your name on the list! Kudos! Wowee! What a dream come true! Congratulations and thanks for being such an inspiration to the rest of us. Great going! David and I are so excited for you! He has read the book and thinks it's really fantastic, so wasn't surprised at your news. I can't even imagine how it feels! I just got back from the book store. I was there because my English teacher lost my original copy of MAZE, so I had to check out the bonus stuff, and probably reread it. Thank you Dashner. This is one of two books that I've bought multiple copies of, and the other one was DEATHLY HALLOWS. no james, thank YOU! your books are totally intertaining and a great joy to read. your brilliant! So saw that coming...congratulations! Sure glad that we had you visit before you were too big for us! All the best! I'm thinking that turning in a manuscript is a big day to celebrate, too. Congrats, James! What an outstanding accomplishment. IS there anything happening on 13th reality book 4? YAY! CONGRATULATIONS!! you deserve it!! I'm not sure if I've commented yet. Internet had a mental break down. Congrats Dashner, that's almost every author's dream: To be a New York Times Bestseller. That's exciting. Congrats James, on all levels! Turning in manuscripts, hitting the NYT bestsellers list, all of it. You so deserve it. When does the death cure come out? OMG, I LOVE YOUR BOOOKS SOO MUCHOS !! - The Scorch Trials . i can read it over & over . - The death Cure . it's such a long time to wait ! when i first read The Maze Runner . 2nd book , it touched me . the first one maybe . i cant waitt till the 3rd one comes out !! cause i really really really need to read the 3rd book !!!! I love this story! Like I said in my headline this story is like somthing that came from a dream (isn't that were it all starts from? :}) that you just don't want to wake up from. Don't get me wrong this story is amazing and a good read.I highly recomend this tale to readers who read the hunger games and loved it. Back to the story it had me thinking and thinking about it, things like how were they suppose to get out of the maze?